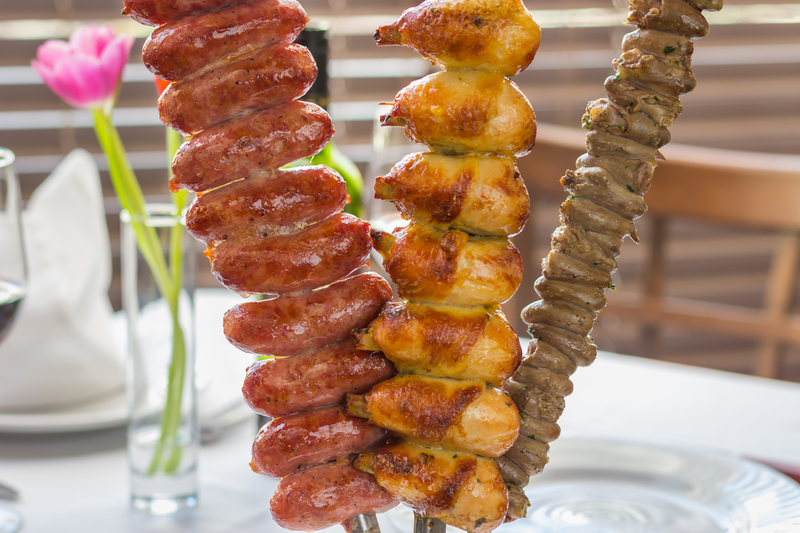 Diners won’t be disappointed when they step inside the doors at Steak Brasil Churrascaria in Downtown Miami. From the moment you walk in, you are pleasantly surprised by the very “at home” feel that you immediately get and you can’t even imagine the feast you are about to indulge in. Walking in, you can expect to be greeted by owner and manager Jaciel Santos who will make you feel as if you just stepped in to his living room. Once inside you get the sense that everyone there is more like family then employees which sets this steak house apart from many others. 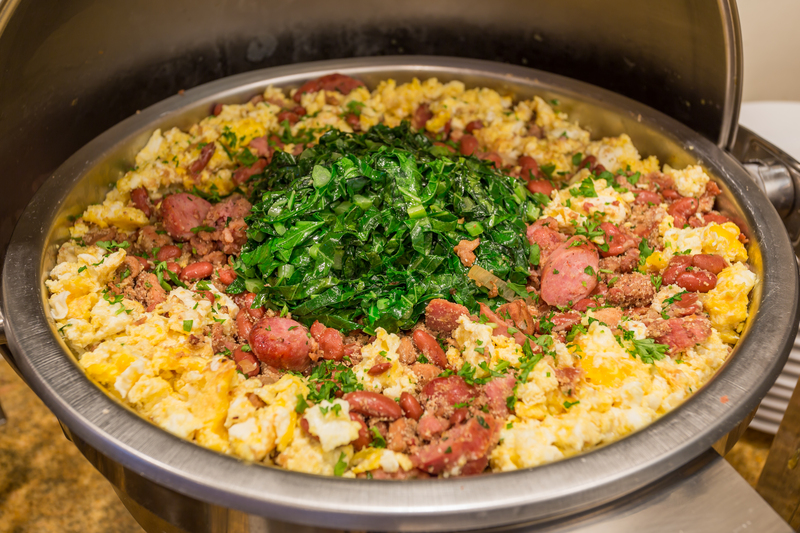 When it comes to the food, I suggest you fast for a few days ahead so that you have room to try it all as this is an all you can eat, buffet of meats and sides. We sat down ordered a typical Brazilian soda, Guaraná, while the waiter gave us the go ahead to begin our food-adventure. 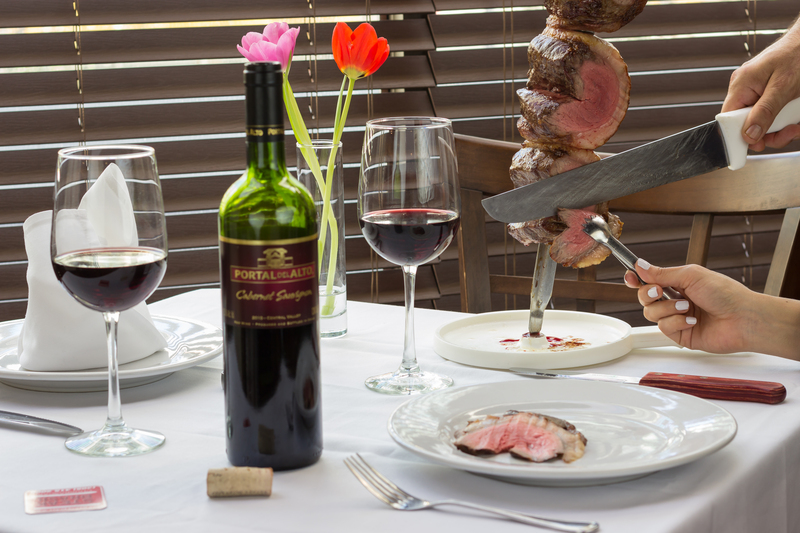 Through out your dinner you’ll have the opportunity to bite into perfectly cooked cuts of picanha, baby picanha costala smoked ribs, Coxa de frago, chicken, sausages, bistec, lamb chops and short ribs to name just some of the flavorful cuts of meat available. 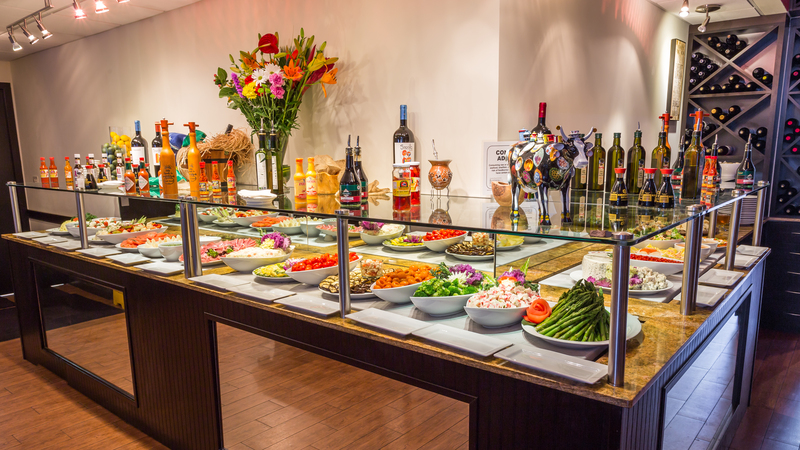 My suggestion is to start off at the salad bar filled with an assortment of mixed salads, various cheeses, vegetables, and then move over to the side dish area where you can select from typical Brazilian dishes such as Feijão Tropero, Moqueca, black beans, white rice, and even some non tradition dishes such as lasagna and a few Greek inspired selections. Make your way back to your seat and get ready to flip your little card to green and you’re ready! One by one the cuts of meat make it to your table and whether you prefer a rare or more cooked piece of meat, there’s a little something for every palate. As the meal progressed we got to know the staff and began having conversations with all of them as if we were long time friends or family talking not only about the food but we also found ourselves talking futbol, learning about where they came from and really just enjoying a nice family dinner. I had a chance to sit with owner Jaciel and was very fascinated by his story and his humble demeanor as well as the way he treated his staff. 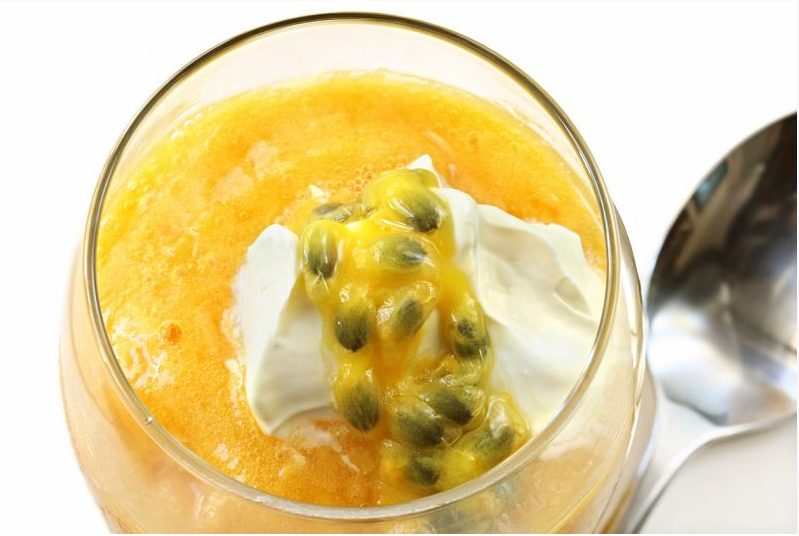 Having worked in almost every front of house and back of house position in the restaurant industry for the last 12 years, Jaciel decided to open his own restaurant and bring an authentic taste of Brasil right to Miami. You can tell there is a lot of love and passion that went in to every detail to ensure every customers would be satisfied. 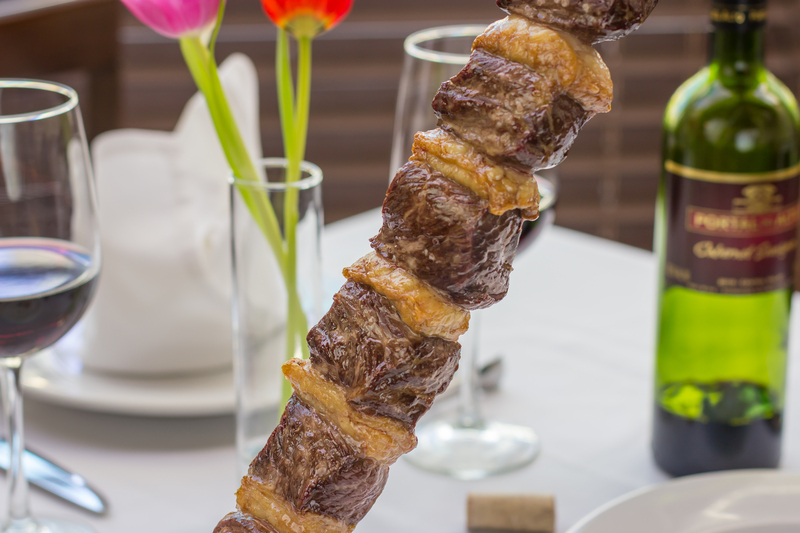 His emphasis on hiring experienced gauchos with over 20 years in the industry really added to the authenticity of the way the meats were prepared and ensured they were packed with flavor in each bite. We closed out the evening with selections (yes, plural) from the dessert cart that featured key lime pie, Pudim de Leite (flan), Bolo de coco (this was my favorite), and a sinfully delicious Bolo de chocolate that was chocolate, on chocolate, on chocolate! At this point we were ready to roll out of there, but we felt so at home it was hard to leave. We came in as strangers and were leaving having made new friends. From start to finish our dinner was perfection. Tucked away in the heart of downtown, Steak Brasil is certainly something to rave about and with such an affordable price it will not only win your heart but wallets as well. 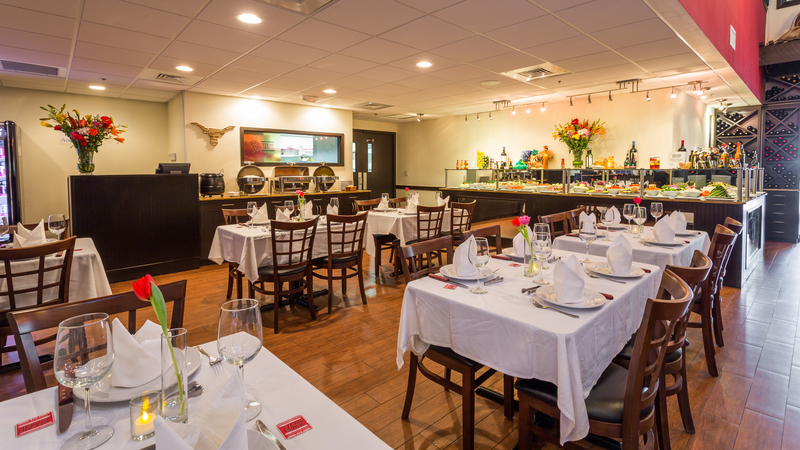 Steak Brasil Churrascaria is located in Downtown on 190 Southeast 1st Avenue in Miami.